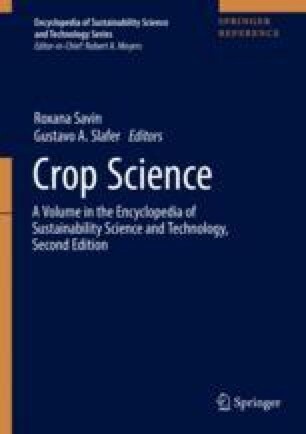 Critical crop N uptake is defined as the minimum crop nitrogen uptake for achieving maximum crop mass. Critical plant N concentration is defined as the minimum plant nitrogen concentration of a crop corresponding to its maximum crop mass. Harvest index (HI) is the ratio between harvested biomass Y (grains, tubers) and aboveground crop mass Wat crop maturity. Intercepted photosynthetic active radiation (IPAR) is the proportion of the incident PAR which is intercepted by the crop at a given time. This proportion is related to the size of the canopy, the leaf area index, and depends also on canopy structure: leaf angle and geometry.